For over 75 years, family-owned Danson Decor has contributed to the spirit of the season while helping to reflect the personalities of home owners across Canada. 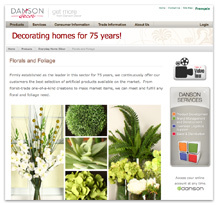 Working with designers, colour forecasters and decorators, Danson specializes in the distribution of floral, home and garden, holiday and indoor accent products of the highest calibre quality at superior value. 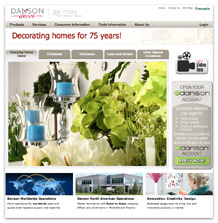 With showrooms in Montreal, Toronto and Hong Kong, warehouses and representatives across Canada and China, Danson Decor needed an efficient e-commerce solution to facilitate, supplement and expand their distribution to new and existing customers. HTC’s work began with the design of bold and user-friendly layouts laden with the striking imagery of the Danson brand and product lines. The elegant front-end interface and intuitive information architecture were designed for optimal usability for both logged-in MyDanson members and public site visitors. A customized installation of the IgnitionWeb internet marketing platform enables MyDanson members to access their tiered product prices, add items to their shopping cart, submit orders and update their profiles. The website is fully-integrated with third party TecSys’ Elite Enterprise Resource Planning (ERP) system to automate order processing while providing real-time product browsing, search capabilities and customer data. Administrator Manager, Media Centre, EasyText Editor, Customer Manager, Mailing List Manager and Site Statistics. Now open for business 24 hours a day, 7 days a week, the new Danson website helps to promote loyalty through enhancing the customer relationship. Greater accessibility to product information and a facilitated means of transacting contributes to increased sales volume from new and existing clientele. Automating order processing and reconciliations while reducing dedicated resource requirements helps to decrease the costs associated with filling an order. The search engine-optimized site also brings Danson increased visibility and bolstered positioning within an expanded marketplace.